By now, everyone — especially the New York Police Department — knows that six years of spying on Muslim neighborhoods, eavesdropping and monitoring mosques didn't generate a single lead or trigger a single terrorism investigation. That was all admitted in court testimony earlier this month. But more than a week after the acknowledgement, the city seems as convinced as ever that public safety relies on police regularly watching and documenting the movements, religious practices, conversations, name changes and student activities of New York’s Muslim communities. 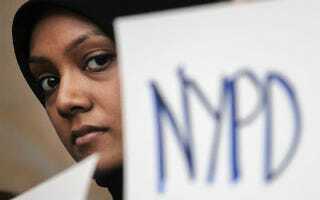 As the deposition made absolutely clear, the NYPD continues to operate within the confines of a belief that Muslims, by virtue of being Muslim, are prone to acts of terrorist violence and must be watched at all times. After the Associated Press revealed the NYPD’s Muslim spying program in an investigation last year, city officials justified the program on the basis that it's helped foil acts of terrorism — 14 acts of terrorism to be precise. Back in March, I called this claim into question, finding that few of the the named plots had indeed been stopped by the NYPD and those the cops played a part in foiling relied on the use of informants who essentially entrapped vulnerable men, pulling them into terrorist plots that were never to come to fruition and then jailing the men.